SO we asked readers of our Daily Update to BullionVault clients which single factor they think will have the largest impact on gold and silver prices in 2015, writes Adrian Ash at the world-leading precious metals exchange online. Topping BullionVault users' votes again last month was "monetary policy"...repeating the No.1 view from our surveys of end-2013 and also mid-2014. Yet the proportion of people saying that interest rates and QE will have the greatest impact did slip once more. Starting at 38% a year ago, "monetary policy" fell to 32% in July and now stands at 29% of private gold-and-silver investors' votes. What factor gained on this drop in confidence? Not the next three big drivers in our survey, as you can see on the table above. The direction of stock markets, geopolitics and derivatives trading each held steady around 15%. And the impact of inflation actually slipped, down from 14% in July's vote to just 9% in December. Instead, and jumping into third-last place with 8%...ahead of the direction of commodity prices (a new choice for start-2015) and above even the impact of Chinese and Indian demand...comes central-bank gold buying. Russia's central-bank gold demand certainly made headlines throughout 2014. The risk that it might now sell some gold to try and rescue the Ruble has spooked some analysts too. Unnecessarily in our view. There's more chance of Moscow denying any claim to Arctic resources than selling gold in 2015. No, the real curve-ball question remains how much gold the People's Bank of China might...or might not...be hoarding. Beijing last updated the world in 2009 after a six-year gap. So maybe 2015 will be the year China's politburo reveals how much gold it has added to the 1,045 tonnes it held six years ago. Already the 6th largest national hoard, China's official holdings will surely move the gold price if a big increase is announced. That's despite the fact that, over the last 3 years, any such increase failed to push the price higher when Beijing actually bought. Fact is, sentiment matters. And with Western currencies all weak outside the Dollar...and that rising Dollar spurring panic in commodity and stock markets...news of bigger Chinese reserves will likely boost institutional investor demand for gold (and hence silver), even if Beijing itself has already stopped buying at $1200 and above for the time being. 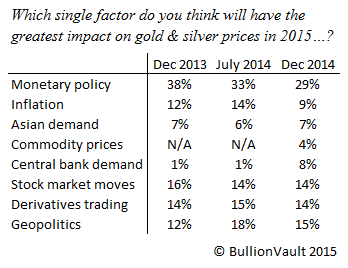 As for monetary policy...still the biggest single driver of precious metal prices according to BullionVault users...the question is whether interest rates will rise from near-zero in 2015...? Not a chance, according to UK banks and building societies. They just cut the rate paid on 70 leading savings products. And in 2015, the Bank of England has copied and pasted its same monetary policy decision from the last 2.5 years...leaving UK base rates at 0.5% and QE at £375 billion. The Bank of England, remember, was clueless about the impending financial crash of 2007 according to internal memos released this week. What about the almighty Dollar? The US Federal Reserve last year "tapered" its new QE money creation to zero from $80 billion per month. That helped the Dollar beat everything except gold bullion, already down 25% in 2013 on the mere rumor of less money-from-nowhere. But now the Fed wants to be "patient" before raising rates from 0%. And that word, according to Wednesday's release of notes from the Fed's end-2014 meeting, "provides more flexibility" than the previous choice of words...which had tied a rise in rates to "normalization" after the end of new QE bond purchases. World growth is slowing meantime, oil prices have sunk and the Dollar is already strong anyway. That puts US inflation below the Fed's 2.0% annual target. So where's the rush? Let's be "flexible"...with a quick return to Dollar QE only ever a press release away. Amongst the major currencies, that leaves the Japanese Yen and the Euro. But after 25 years of economic slump and deflation, consumer confidence in Japan is now worse than before "Abenomics" began printing record amounts of money to try and juice the economy by destroying the currency in 2013. And a very similar slow, grinding deflation is now lapping at the Eurozone as well. Expect QE, not a rate hike, from the world's single largest economic bloc in 2015. The European Central Bank next votes on policy on 22 January...three days before Greece goes to the polls. That election looks effectively like a vote on whether or not to repay Athens' huge debts...or go into default...hurting German and French lenders, throwing Greece's membership of the Eurozone into doubt, and raising the risk of popular support for debt default across the weaker Euro nations. Ahead of all this, the gold price in Euros has gained 5.2% over the first week of 2015...hitting its highest levels since September 2013 above €1000 per ounce. Silver has jumped 7.7% to 4-month highs at €14 per ounce. Simplistic, perhaps, to join the dots. But monetary policy...and monetary politics...really do have an impact on the price of physical bullion. No one's to create, gold and silver owned outright are no one else's liability either. In a world stuck with greater debts than triggered the 2007-2012 meltdown, savers and bondholders might be wise to buy a little insurance. Because when debtors can't and won't pay, the creditors must.